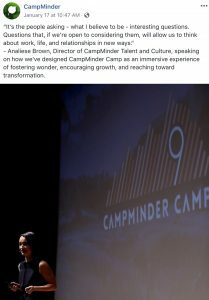 This week I had the pleasure to attend CampMinder Camp 9 in Boulder, Colorado. 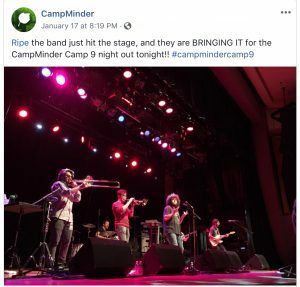 CampMinder is the company that we partner with to host our database, run our online registration system, share camp photos with parents, complete and store online forms and a whole lot more. Every other year they host a conference which brings together the best minds in the industry. We have the opportunity to learn about all aspects of running successful camps and also to participate in creating the future vision of CampMinder. 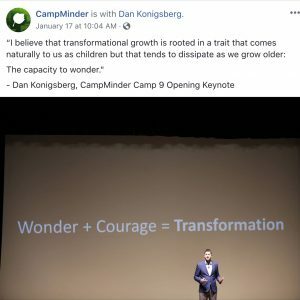 CampMinder staff began the opening keynote by sharing the transformation that has taken place within their business, why it has taken place and how it is going to benefit our camps. 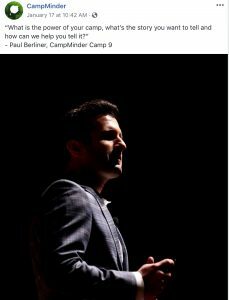 The restructuring of the company will lead to quicker upgrades that are more aligned with the core needs of CampMinder’s clients. Everyone was thrilled to hear about the exciting mobile upgrades coming which is something we know our camp parents are going to love. This was followed by an inspiring presentation by Seiku Andews, the leading poetic voice in our country who has performed for President Obama and Oprah Winfrey among others. 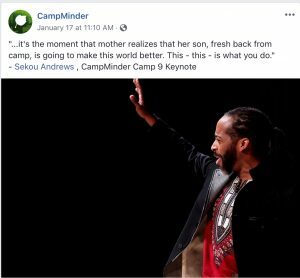 Camp directors aspire to tell stories to describe the power of camp in the way that Seiku uses language to entertain and inspire people across the globe. 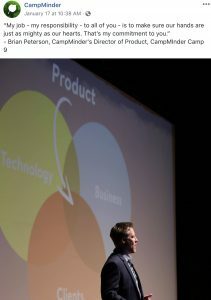 There were over 50 sessions to choose from spanning the categories of Marketing & Recruitment; CampMinder System; Culture & Leadership; and Product Development. We heard from veteran camp directors and other professional speakers including Gerry Valentine, Public Speaker, Founder & Executive Coach; Audrey Monke of Sunshine Parenting; Peter Ross, Jason Bornfriend & Kaitlyn Merola of 829 Studios, a marketing firm that focuses on camp and travel; and a powerful closing keynote and exercise delivered by Priya Parker, founder of Thrive Labs and author of The Art of Gathering. Camp conferences by rule are gatherings of fun, outgoing people and generally have a great vibe throughout. CampMinder Camp takes this to the next level. This company has been recognized by Built In Colorado & Outside Magazine as a top place of employment due to their outstanding culture and growth as a business. They have a member of the team whose title is Director of Talent and Culture…and they only hire individuals who share the company’s core values no matter how skilled an applicant may be. The culture of the company sets the tone for the conference. We are inspired, we walk away with practical knowledge that can have direct positive effects on our camps and businesses and we have a lot of fun! In one session we were doing a group exercise and I had to complete the sentence, “I am happiest when…” Now of course in this room the easy answer is “when I’m at camp” but we were trying to think a little outside the box in order to connect with others in the group. My completion of the sentence was “when there is music playing.” And boy did that ring true when we all gathered at the Boulder Theater after day 1 to see the outstanding band Ripe. Now I was listening to live music and deep in conversation about camp marketing and programming, my favorite camp topics. Ripe played their own original funk and soul music and mixed in some great tunes including Lola by the Kinks, Under the Bridge by Red Hot Chili Peppers and Go Your Own Way by Fleetwood Mac. I consider the people I spend time with at this conference my friends. We only see each other a few times a year and most of us know little about each other besides our shared passion for creating meaningful experiences for children (and whatever is posted on Facebook). However these conferences bring people together in a way that allows bonding among new friends and old as we sit together in sessions and meals and share our desire to improve summer camp and show the world what is best for our children. So back to the exercise described earlier (and eliminating the obvious answers of “surrounded by family” and/or “at camp”), I am happiest when I am surrounded by smart people with great values who love to collaborate in order to support each other’s missions. And in our business, one way or the other, each of our missions is to create meaningful experiences for children that produce young adults with excellent values. And we are doing it.